Don't Use Out Of Tolerance (OOT) Gages Displaying Incorrect Data. Our client base includes a diverse range of industries including: Aeronautical, Defense, Automotive, Government, Research, Medical, Pharmaceutical, Energy & Power, and Transportation. We can calibrate your hand held devices as well as the shop units at your location. We will skip the sales pitch. Take a look at our blog for useful information regarding calibration. Calibration Basics: What is Calibration? UUT(Unit Under Test)- against a standard of known accuracy. Our ASQ Certified Calibration Technicians compare how closely the UUT ( Unit Under Test) compares to the standard. Alliance Calibration provides a calibration certificate with before and after data and measurement uncertainty. the specified needs of the customer. 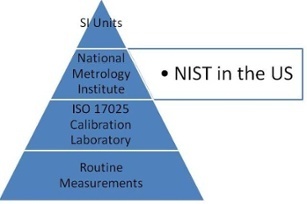 the appropriateNational Metrology Institute (NMI). Our automatic Recall System notifies customers of upcoming calibration due dates. Our customers can access their calibration data 24/7 with CalEnvision- Our On-Line Calibration Asset Management System. We are ISO 17025 accredited.